What do SCHEMA and your weekend shopping have in common? – It’s simple: When you reach into that refrigerator in the comfortable air-conditioned supermarket, it’s very likely to contain several pieces of DAIKIN technology. DAIKIN is the world’s leading manufacturer of heat pumps, ventilation systems and air-conditioning and refrigeration systems. The multinational Japanese company with headquarters in Osaka and 67,000 employees worldwide offers solutions for hotels, office buildings and supermarkets, and also for domestic use. Plus: DAIKIN has chosen to use SCHEMA ST4 and the Content Delivery Server to create smart, interactive manuals. In their talk ‘DAIKIN Service Information at your service’ at the SCHEMA conference, Peter Lemahieu and Lore Vertongen explained why SCHEMA is the best solution for DAIKIN. All in all, thanks to more and better self-service tools (e.g. manuals and app), there should be a switch from agent-assisted help desk support to customers being empowered to act independently. A current topic of the service manuals is the processing of error messages. As soon as one of these is issued by a device component, the service technician should be guided interactively from the error message to the final solution. The idea of this is to start with simple checks before replacing complex or expensive components. These checks are carried out via a logical series of yes/no questions, with the next steps being indicated depending on the answer given. This checking procedure is modelled in ST4 and generated from the same source for the different output formats. 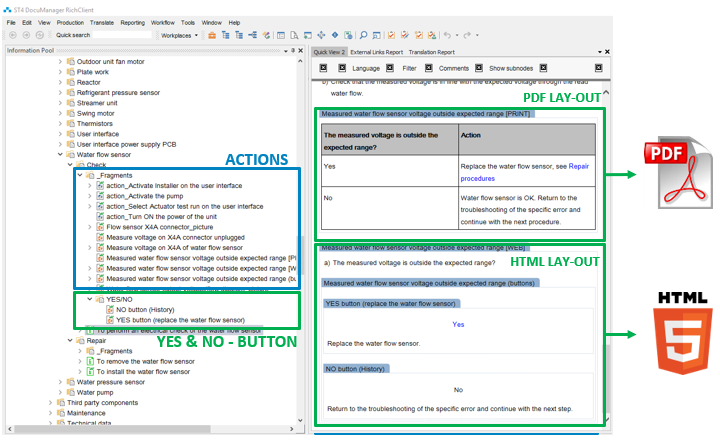 The implementation of the queries in PDF format was done using an existing layout which was also used for the other manuals in ST4 (installation and operation manuals). The checks are displayed in a clear table format. For implementation in HTML format, a layout was redesigned with a view to the fact that SCHEMA ST4 can be used to create interactive HTML outputs. The interactive behaviour is defined by metadata. The fragments for controlling ‘yes’ and ‘no’ in the troubleshooting checks (e.g. also information nodes or warnings) are identified using metadata. Their behaviour and layout as yes/no buttons are controlled accordingly. They are used in the yes/no questions, which are followed each time by a link to the next step. In this way, all the service information available is able to feed into the problem resolution. The ‘e-Doctor’ by DAIKIN is an app that guides the service technician through the troubleshooting process. The same information that is used for the HTML output can also be used for the app. This is where the SCHEMA Content Delivery Server (CDS) comes in. The data from ST4 is uploaded to CDS. This includes content, metadata and also, for example, a product tag which maps a node to a DAIKIN product. The ‘e-Doctor’ accesses the CDS via an interface. When a new session is started, the model name can be entered in the app manually or scanned in using a QR code. By comparing the model name with the product tag from ST4, the ‘e-Doctor’ knows which data needs to be displayed and outputs the correct data with the correct layout (defined via CSS) on the screen. Find out more about the ‘e-Doctor’ in this video from DAIKIN. There are plans to produce the service instructions for all the newly developed products in the EU in ST4. Troubleshooting information for older models is transferred to ST4 for use in the ‘e-Doctor’ app. Animations and videos should also be implemented in the HTML output and in the app. The app receives additional features and functions, e.g. content and user interfaces are translated into other languages. 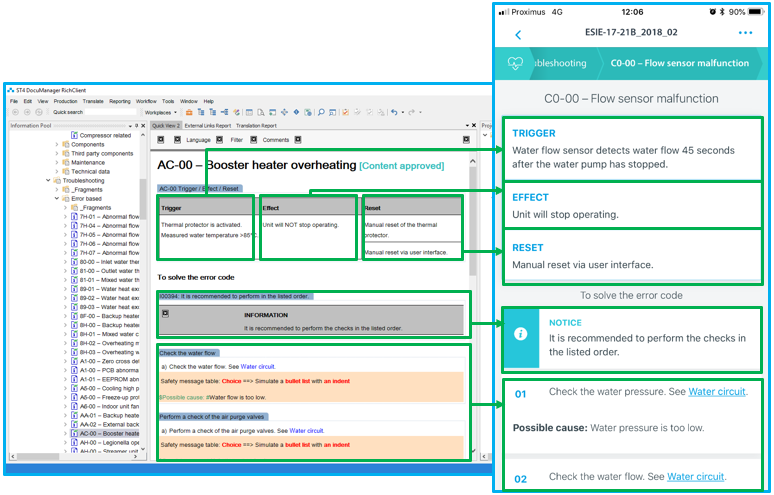 In the near future, all installation manuals, operating manuals and service manuals are to be transferred automatically from ST4 via the Content Delivery Server for publication in the DAIKIN customer portal. With the smart solutions from SCHEMA, there’s no need to lose your cool even when an error message appears!